These beautiful designer thank you cards feature a colorful peacock feather which enhances the front cover. Peacocks are one of the most beautiful birds due to their colorful, patterned tail feathers that are often thought to be a symbol of good luck and pride. 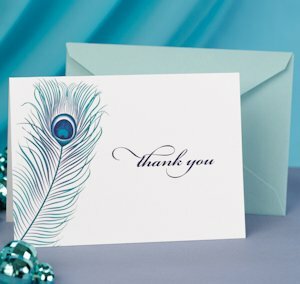 These folded peacock thank you note cards are made from 100# high white paper and measure 4-7/8" by 3-1/2". Sold in a package of 50 with coordinating blue envelopes.